Serving The Eastern Shore, Ocean City, Maryland, Lewes, Rehoboth Beach, Bethany Beach, Fenwick Island, Delaware and The Surrounding Area. Services Available Packaged and Separately. Jimmy has played with the likes of Carlos Santana, Cat Stevens, Neil Young, Van Morrison, Paul McCartney, Jerry Garcia, Bruce Springsteen & other artists…while relaxing on the couch with his music collection, and hopes to perform with them for real, on stage someday. You’ll hear covers of these artists & many more, as well as original songs, in Jimmy’s solo set. Raised in a musical household, Jimmy started guitar lessons at age five. He studied with many prominent private guitar teachers over the years, including jazz artist John Dougherty, exploring The Berklee Method of Music Theory, Composition and Performance. Currently writes, records, produces and performs live and as a studio sessions musician, with a résumé that includes notable regional and national artists. Jimmy's musical background includes mostly Traditional & Classic Rock, Blues, Soul, R&B, Funk, Latin & Jazz. His playing is generally rooted in the tonality of the song with a great sense of rhythm, melody and pacing so that the listener is carried along even during improvised solos. While playing with highly respected jazz guitarists, artist and mentor, John Dougherty, John expressed what he heard as a strong similarity in Jimmy's sound and technique to solo artist, prolific studio sessions guitarist and "Steely Dan" Alumnus, Larry Carlton. 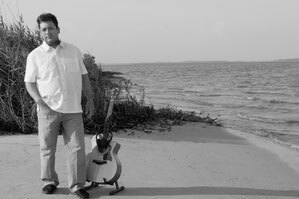 Seaside Jimmy - Professional Musician & DJ Specializing in Acoustic Guitar/Vocal Beach Ceremony Music on the Sand, Various Events & Wedding Receptions.